Welcome to a 3-part series, highlighting Karthik Rampalli's life. In Part 2 to learn more about Karthik's experiences of co-founding the MEXT Scholars Association (MSA), working at various part-time jobs and internships, and organizing 5 TEDx events and 1 Hackathon. Then in Part 3, you will learn about Karthik's perspective on living in Japan and the benefits that come from it, and Karthik's overall appreciation and gratitude to those who helped him achieve everything he has accomplished thus far, as well as the MEXT Scholarship. And finally, learn some important clues to help make the best use of various opportunities in Japan. Introducing Karthik Rampalli — a go-getter, who organizes TEDx events, Hackathons, dabbles in modeling, interns at Deloitte Tohmatsu Venture Support, and also interns at another Venture Capital company. Oh, and by the way, he's also a full-time undergraduate student at Tokyo Institute of Technology (Tokyo Tech). As I listened to his story, I couldn't help but be impressed with his passion for learning new things in the realm of technology, economics, conglomerates and multi-national corporations, startups, finance, and languages. In fact, he speaks 6 languages — English, Japanese, Hindi, Sanskrit*, Telugu, Japanese, and German (in-progress). In January 2015, Karthik was informed that he received the prestigious MEXT Scholarship for 1 year of intensive Japanese Language Study, plus a 4-year undergraduate degree. As a MEXT Scholar, he not only receives a monthly stipend that covers all of his living expenses, but all of his school fees are taken care of by the Japanese government. And in India, where there are over a billion people, the competition to receive such an exceptional scholarship is fierce. In fact, all scholarships are difficult to obtain, as there are more people vying for a slim number of spots. Extremely fortunate and grateful for this wonderful scholarship, Karthik constantly reminds himself, of all the people who have helped him get to this point, especially the high school friend and a current MEXT scholar, who first told him about this amazing scholarship. Similarly, Katrina Navallo was also informed about this scholarship through a classmate. Thus, having a wide, diverse network, plus a significant amount of independent research online, is crucial to learning about this amazing scholarship, amongst countless others. That's why Schoolynk was created to help those, who seek to come to Japan for work and studies. While studying in India, Karthik was never particularly interested in J-Pop, anime, manga, etc., but he was captivated by the history, culture, and economy of Japan. In fact, any time Japan invented something new or developed innovative, R&D technology, the news became viral in India. Some of the many examples that Karthik mentioned were: the bullet train, Nintendo's game boy, just-in-time manufacturing, or bots that can play instruments, and much more. And one of the most impressive historical elements for Karthik, was how Japan completely revolutionized its economy within 15 years, post-WWII, to become the world's 2nd largest economy by the late 1960's. Both the history and the innovation, are what ultimately, attracted Karthik to moving to Japan at the age of 18. 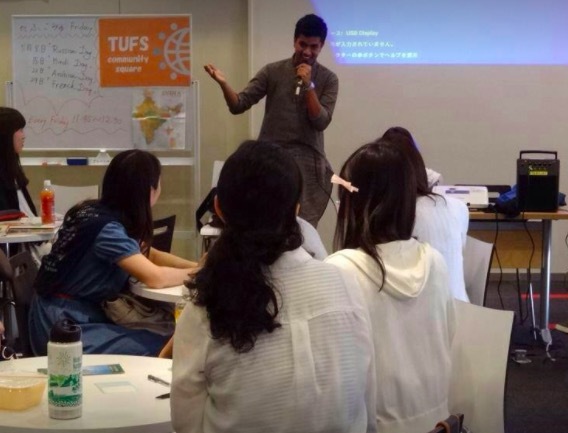 Then, in April 2015, Karthik moved from his hometown, Hyderabad, to start his intensive Japanese language course for 1 year at the Tokyo University of Foreign Studies with 0 language skills. Fortunately, he was already equipped with a gift for learning languages. In fact, he already spoke 3 languages — English, Hindi, and Telugu — before he even arrived in Japan. Plus, he could read Sanskrit liturgy. That being said, it was still an uphill battle, as he had to learn approximately 1,500 Kanji characters by the end of the first year, plus hiragana and katakana. And what was even more terrifying for him was his absolute need to pass the university entrance tests (in Japanese) in order to qualify for his specific undergraduate degree. But that wasn't the most challenging component of his first year. Karthik had to conduct, and pass, his undergraduate entrance exams in Japanese that were based on STEM — or Science, Technology, Engineering, and Mathematics. Plus, he had an in-person entrance interview with 5 Japanese gentlemen, entirely in Japanese. Although he was extremely worried at the time, he worked extremely hard, did his best, and successfully, passed all of the exams and interviews. And that’s how Karthik earned his acceptance into Tokyo Tech's Department of Information Engineering. Apparently, Tokyo Tech is the only place in Japan with a supercomputer called TSUBAME3.0, or Tokyo-Tech Supercomputer and Ubiquitously Accessible Mass-Storage Environment. Established to “foster advanced education in computer and computational sciences,” it's available to all students and the public, who receive prior approval. And recently, Professor Yoshinori Ohsumi won the Nobel Laureate Prize in Physiology or Medicine for his contributions towards the underlying mechanisms of autophagy. Besides the supercomputer and Nobel Prize-winning professor, Karthik particularly appreciates how he can take a diverse range of courses in the realm of STEM. Thus far, he has taken courses ranging from Media Management to Intellectual Property Rights, giving him the best of both the arts and sciences. After passing Tokyo Tech's undergraduate entrance exams, and solidifying his Japanese speaking abilities, the language barrier was no longer such a big hurdle. Now, he could focus on acclimating to his university life, making new friends, exploring his new “home,” and making the best of his future in Japan. Thank you very much for reading this article. Check out Part 2 about co-founding the MEXT Scholars Association (MSA), working at various part-time jobs and internships, and organizing 5 TEDx events and 1 Hackathon. And in Part 3, you will learn more about Karthik's advice for those who want to follow in his footsteps, as well as the benefits and challenges that inevitably come with living abroad as a foreign student in Japan.